Melt 1 1/2 tablespoons Country Crock® Spread in 12-inch nonstick skillet over medium heat and cook 1/2 of the plantains, turning once, 4 minutes or until golden brown. Remove plantains to platter and keep warm. Repeat with remaining Spread and plantains. 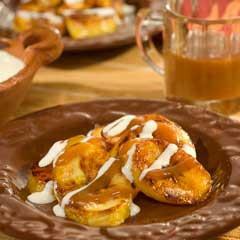 Serve plantains drizzled with caramel sauce and Mexican crema.